Born to Japanese immigrant parents in Seattle, Minoru Yamasaki (1912–1986) became one of the towering figures of midcentury architecture, even appearing on the cover of Time magazine in 1963. His self-proclaimed humanist designs merged the modern materials and functional considerations of postwar American architecture with traditional elements such as arches and colonnades. Yamasaki’s celebrated and iconic projects of the 1950s and ’60s, including the Lambert–St. Louis Airport and the U.S. Science Pavilion in Seattle, garnered popular acclaim. Despite this initial success, Yamasaki’s reputation began to decline in the 1970s with the mixed critical reception of the World Trade Center in New York, one of the most publicized projects in the world at the time, and the spectacular failure of St. Louis’s Pruitt-Igoe Apartments, which came to symbolize the flaws of midcentury urban renewal policy. And as architecture moved in a more critical direction influenced by postmodern theory, Yamasaki seemed increasingly old-fashioned. 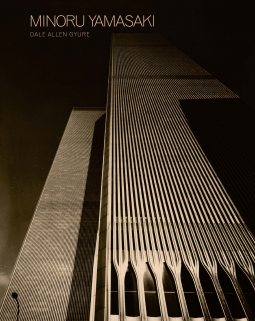 In the first book to examine Yamasaki’s life and career, Dale Allen Gyure draws on a wealth of previously unpublished archival material, and nearly 200 images, to contextualize his work against the framework of midcentury modernism and explore his initial successes, his personal struggles—including with racism—and the tension his work ultimately found in the divide between popular and critical taste.